The well-known Bertram firm established the Hen and Rooster Knife Company in Solingen, Germany in 1864. Their quality and attention to detail took the knife world by storm. The firm has changed hands a number of times, but the Hen and Rooster name retains the repect of knife collectors the world over. Our Hen and Rooster Congress has four blades made with high carbon steel for easy sharpening: two-2 inch highly useful sheepsfoot blades, a smaller, 1 3/4 inch slightly modified cut-off sheepsfoot blade, and a 1 3/4 inch pen blade. 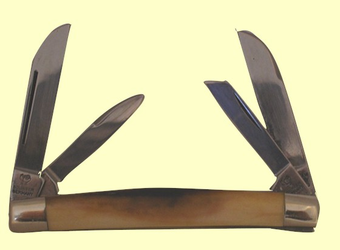 this useful knife has Nickel Silver bolsters and a brass liner. It is 3 1/2 inches closed. Shown with Peach Crystalline Fossil Walrus Ivory (with a little bark edge to boot!) An altogether gorgeous heirloom knife anyone would be proud to carry and/or collect. Choose your preferred type and color Fossil Ivory at no extra cost - And personalized with up to 8 initials. Comes with a leather belt sheath that fits unobtrusively anywhere along your belt and a felt storage pouch. As an added option, we will scrimshaw an etching of your favorite scene, pet, a ship of your choice, or your own boat (sail or power)on one side - Just email or snailmail us a picture. Please note: scrimshaw theme and personalizations not available on Dark Brown Mammoth Ivory.